Reviews & Blogging 101: Why Is It Important to Use Facebook and Twitter for Your Blog? Simply Stacie: Facebook is great for building community and getting to know your readers on a more personal level. I love going on my FB page and talking to my readers. I love asking qs and getting feedback on whatever is on my mind whether it be blogging related qs or regular qs to get to know people. It gives your readers another way to find your site if you have posts going to your page. Make sure to get on there though interact with people and not just have it being another spot where your feed goes. Twitter is great for the same reason and moves very quickly! You can ask a q and get a bunch of different answers in a matter of minutes. If you are promoting something on your site, a tweet can be very helpful in reaching a ton of people quickly. Survey Junkie: I have both Facebook and Twitter and they reach more people than I ever could imagine reaching with just my blog. Not to mention that they help bring up your follower count and are stats that companies look at. Twitter is my favorite. It’s fast paced and there’s always something new. I also like that I can make $ for my tweets which helps pay for blog upgrades etc. Outnumbered 3 to 1: I think Facebook and twitter are essential tools in promotion of every website. The more places your blog is seen, the more traffic you’re going to get generally. Consider having your blog posts link directly to Twitter every time you publish a post. You can also have all of your “tweets” go to your Facebook page. Laughing Lindsay: It allows my readers to further connect with me outside the blog itself. Plus, I can share things with my followers without having to make an entire post about it. Boobies, Babies and A Blog: I don’t necessarily think either are critical…but definitely help in networking & getting the word out about your blog, giveaways, & reviews. Mommy PR: Twitter branches out so far that you can bring in new traffic all the time. Facebook is essential to keep the traffic coming. It stays fresh in your readers minds every time you post something new. Crissy Page: Having a Facebook page and Twitter account are absolutely vital for any blogger hoping to take their blog to the next level. Run, do not walk, and set up accounts for your blog. Between the Lines: I think Facebook and Twitter are very important to my blog. These are places where most of my readers visit several time a day, and therefore it is more likely that they will see a link I provide and swing on by for a visit. Through Feedjit, it is easy to see where readers come from. And more than 50% of the time, they are coming directly from Facebook or Twitter. Thanks, Mail Carrier: The reach! Twitter and Facebook both reach an enormous number of people and you can bring in a lot of traffic to your existing reviews and giveaways. Also, connecting with companies and sponsors through Twitter and Facebook is more and more common so you can also use them to find and set up future reviews. Sunshine Praises: Facebook seems to be the #1 way that followers get to my giveaways. I do try very hard not to over post because I don’t want to be “hidden” Which is something I think most FB likers to immediately. Twitter is alright but I don’t’ see as much fruit from there. I don’t think I use it as effectively as I could. 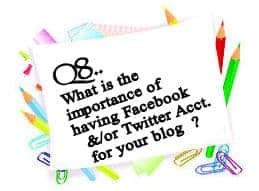 Acting Balanced: Twitter has become a great tool for me – especially for my giveaways – Connecting with sponsors on their facebook and twitter sites have helped me gain followers by encouraging their followers to enter, and my followers to join their facebook and twitter pages… it’s a win-win. Still Blonde After All These Years: Facebook is my most valuable resource. I know that information can go out immediately and be repeated as needed via reposts or updates or event notifications. It is so valuable because it has its own address, it gives “Likers” an avenue to comment. I just cannot say enough about the value of a facebook page for our blog. Eighty MPH Mom: They both increase your exposure, and people who aren’t subscribed to a blog can still find your latest posts/giveaways, etc., if they follow you on Twitter or like you on Facebook. I think that reps also look at these numbers to see what a blog’s potential reach is. Little Yayas: I don’t have a Facebook page. When I started I used the social media networks that worked easiest and best for me and my site. At the time many people I worked with didn’t feel that Facebook did much for their site, so it wasn’t something I signed up for at that moment. I would like to eventually start a Facebook page since I have seen statistics for other sites who use it. As far as Twitter it is one of my higher traffic producing accounts. I receive a good amount of traffic from my twitter, so this is the social media link that I have and work hard to expand. I was so afraid of Twitter, but now I can’t live without it. I love the instant connections I’ve made there and how news travels so quickly. Facebook helps me reach a lot of people who just can’t be bothered to check for blog updates. If you use applications that will automatically send your new blog posts to Facebook and Twitter, you get a lot more exposure for less effort. While overdoing the posts on Facebook can scare people away, you definitely need to look for ways to connect personally with your fans and do more than just link up blog posts. On Twitter, it’s a faster paced environment where tweets quickly get buried. Post the same link to your blog post at least three times in the same day so you hit the various time periods. I have a good deal of facebook followers but I can’t get the interaction, any tips there?? Thanks! Going to review yours too. For FB, its important to get on there and ask questions and talk. Post status updates, share OPC (other people’s content) that will interest people…this is what i found worked for me. Thanks for this continuing series. I stumbled and will post on my facebook tomorrow! I use Twitter but some of the people on FB are professional contacts that I don’t necessarily want reading my blog. Although, my twitter name is my real name and someone told my boss to google me. He did but luckily he thought it was funny.